Coverage: Reports, select highlights and reaction on the BBC Sport website. He climbed onto the table and into the hearts of the millions watching around the world. Will Bayley's emotional celebration became one of the most iconic images of the Rio Paralympics as he claimed table tennis gold to avenge his defeat in the London 2012 final four years earlier. "People had written me off and I was so overwhelmed from winning that, before I knew what I was doing, I was up on the table thinking, 'How did I get here?' the 29-year-old told BBC Sport. Life since those Games has been almost as dramatic, having made what he claims was a "cringey" appearance on Channel 4's 'Celebrity First Dates', before meeting his girlfriend at a post-Paralympic party back in the UK. 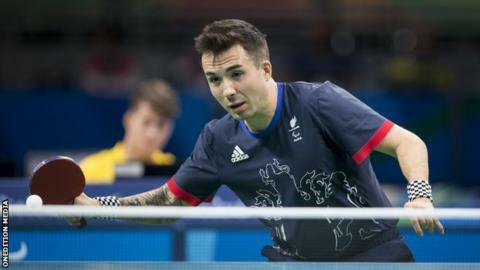 Bayley - who has arthrogryposis in all four limbs and took up table tennis after suffering with cancer as a child - described a "crazy but fun" year that has also seen him receive an MBE, begin competing against able-bodied players in Croatia, and learn he will become a father. Things show no signs of slowing down this week as he bids to complete an unprecedented triple crown by adding European gold to his World and Paralympic titles, just days before the birth of his first child. Will Bayley celebrating winning the Class 7 men's singles gold medal at the 2016 Rio Paralympics. Bayley developed something of a reputation for wild celebrations by jumping into the arms of GB coach Gorazd Vecko after winning his London 2012 semi-final. The pair joked ahead of Rio 2016 that they should plan something else but. not wanting to jinx the occasion, nothing more was said. "I was on match point and obviously everything was really tense but it suddenly came into my head that I hadn't decided what to do if I won," said Bayley. "It had been a difficult match, my emotions were all over the place, I was stressed and remembered losing at London 2012. "Then, the moment I won, for some reason my first thought was 'jump.'" The climb was not easy for someone with Bayley's degree of limb impairments, but such was his joy that he practically flew onto the table. Not everyone was happy - one of the officials yellow carded him for 'unprofessional conduct' - but Bayley didn't care, even attempting to embrace her as he climbed back down to earth. "She'd given me a hard time during the match and I was starting to think she didn't want me to win, so I gave her a hug," he said. "She still wasn't happy, but I was because it was such a special moment and gold meant everything to me." As with the Team GB Olympians a month earlier, the ParalympicsGB medal-winning stars were flown back to the UK in style and Bayley revelled in the limelight. He was pictured playing ping pong on the plane before departure and "hung out" with the pilot once the TV crews had been removed and the flight was airborne. "It was so special," said Bayley. "I was like, 'Wow, I never expected to be first-class on a flight ever,' so that was a privilege, and celebrating with the athletes who'd won gold was a day I'll never forget." Medals can mean money and opportunities come your way if you're a British Olympic or Paralympic podium finisher. Bayley, who also claimed team bronze for the second Games in a row in Rio, was open to offers for the few months following the Paralympics, and an appearance on the celebrity version of Channel 4's 'First Dates' did not faze the Londoner. "It was surreal, but I'd watched the programme before and knew what to expect, so it was a great experience," he said. "I just can't bring myself to watch it back though; first dates are hard enough and I just think it would be so cringey to watch myself." His date described Bayley as a "real inspiration" and they parted as friends. Within weeks Bayley met his now girlfriend Fiona York at a reception in Westminster - the pair hit it off instantly and within months were expecting their first child, due to arrive on 4 October. Bayley admits their whirlwind romance has been "all very fast but exciting" and that he cannot wait to become a father. "Everyone around me knows I'm a pretty full-on, intense, driven player and that table tennis is basically my life," he said. "To have something outside of table tennis has actually made me feel a bit more relaxed about competition and my career has helped massively." The couple do not know the gender of their child and are therefore yet to decide on a name, but they have agreed on Bayley's movements over the next week. "If she goes into labour before I compete I'll go back to the UK, but if I've started I'll finish here," said Bayley, who begins his European campaign in Slovenia late on Thursday. "Obviously I'm hoping they can hold on as I don't want to miss it!" No British table tennis player has ever held the European, World and Paralympic crowns simultaneously, and history is something that motivates Bayley. "I always look for new targets and new goals and to do that and go down in history for table tennis would be an absolute privilege," he told BBC Sport. "I want to be the best I can be, and if I win the European championships and hold all three I would be able to say I was definitely the best of my generation." With the majority of the world's leading Class 7 players hailing from Europe, the standard is high and Bayley is predicting a "real battle" for the title in Slovenia. Bayley hopes that his recent decision to begin competing for STK Starr - an able-bodied professional table tennis team in Croatia - will aid his bid. "It's all about improvement and trying to learn different styles of play," said Bayley, who is the first disabled player to compete in the country's top-flight division and marked his debut with victory at the weekend. "I didn't think someone of my class could ever play at this level, and a lot of people thought I couldn't, but it's good to prove people wrong and a win shows I belong here." Bayley will play in 20 matches this season but, unlike his team-mates who are being paid, he will at this stage only receive travel and expenses. The two-time European silver medallist hopes this will change in the future, but is happy to be "opening up opportunities" for fellow disabled athletes. Bayley also believes the experience will be key to helping him achieve his long-term goal of a successful Paralympic gold medal defence at Tokyo 2020. "At my first Paralympics in 2008, the standard wasn't crazy high, but it's progressed massively since then," he said. "I genuinely feel that to have any chance of Paralympic gold in 2020, I've got to push myself. I have severe disabilities in all four limbs so I'm proud to be winning."